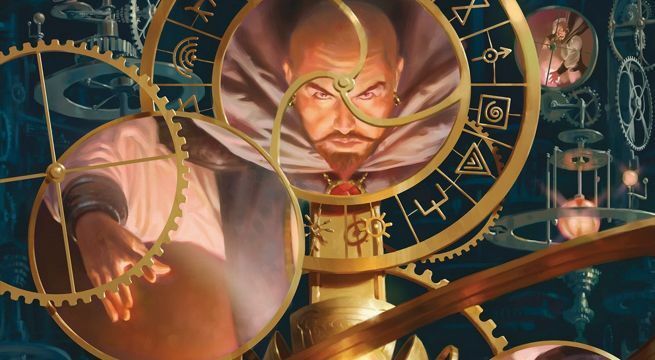 Dungeons & Dragons' newest book Mordenkainen's Tome of Foes is all about conflict, lore, and lots of creepy monsters. There's something in Mordenkainen's Tome of Foes for everyone, but there's two types of Dungeons & Dragons players who will particularly love the game's new publication: Dungeon Masters looking for inspiration for their ongoing (or upcoming campaigns) and players who love reading about the complex conflicts and mythology that builds the foundation of a high fantasy world. Mordenkainen's Tome of Foes is the spiritual successor to the 2016 publication Volo's Guide to Monsters. Part Monster Manual and part storybook, Mordenkainen's Tome of Foes is focused on the various conflicts of the D&D multiverse, ranging from the terrifying Blood War between demons and devils (each of which represent a different "type" of evil on the alignment chart) to the Gith civil war that rages across Limbo and the Astral Plane. The entire first half of the book is dedicated to these conflicts, with pages upon pages of gorgeous illustrations and details about the motivations, gods, and cultures of the various factions. Some D&D players might look at all the lore as a bit superfluous as a bit of a waste, especially if they're running in a campaign set in their own handmade world instead of in Faerun, Eberron, or one of the other "official" D&D settings. But the lore is meant as much to inspire players as it is to inform -- this book is the flint from which a thousand different ideas for campaigns or adventures can launch from. The second half of the book contains over 100 monsters with Fifth Edition stats, ready to be added into a campaign immediately. Some our classic monsters like the Demogorgon, while others are new monsters like the Oblex or the Corpse Monster. The only downside to the new monsters is that the collection is very heavy on races and monsters covered in the first half of the book. There's tons of humanoids and fiends to choose from, but very little in the way of beasts or plants. For those who aren't DMs, Mordenkainen's Tome of Foes also contains multiple new races and subraces to use for their next character. The gith, a classic race of characters, make their first appearance as a playable race, along with the shadar-kai, the eladrin, and the duergar. I thought the tiefling subraces were a particularly neat touch. Each subrace is tied to the Archdevil of the Nine Hells from which a tiefling's infernal heritage is derived. As with Volo's Guide to Monsters and Xanathar's Guide to Everything, Mordenkainen's Tome of Foes contains plenty of side notes and flavor text written by the famed wizard Mordenkainen himself. Mordenkainen is a bit more dour than Volo (an explorer known for exaggeration) and Xanathar (a sarcastic Beholder who lives under the city of Waterdeep), so his notes tend to add a hint of danger to lore contained within his book. There's also a few teases about Mordenkainen's own past, including a couple that should appeal to longtime fans of the D&D franchise. As an "Always GM," I thought Mordenkainen's Tome of Foes was a great edition. The book inspired me to prep a new D&D campaign using some of the lore from the book, and the new races, monsters, and lore all fits seamlessly with previous Fifth Edition text. While it's not a necessary book (but then again, even D&D developers will say that the only "essential" book is the Player's Handbook), it should sate needing a fix of new D&D content.